Laura Walker (Edmonton)/Kirk Muyres (Saskatoon), Nancy Martin (Saskatoon)/Tyrel Griffith (Kelowna, B.C. ), Jocelyn Peterman (Winnipeg)/Brett Gallant (St. John’s, N.L) and Kadriana Sahaidak/Colton Lott (Winnipeg Beach, M.B.) kept their hopes of winning the national title alive after winning quarter-final games on Saturday night. 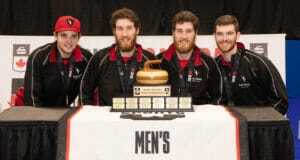 Peterman/Gallant, the 2016 national champions, surged forth to an early lead and refused to let Jolene Campbell/John Morris back into the game. They capitalized on a Morris runback miss in the first end to score three with hammer and then stole another two in the second end for a 5-0 lead. But Peterman/Gallant continued to play lights-out en route to a 9-1 win. The duo shot 92 per cent throughout the game that lasted six ends. “We put our first 15 rocks or so in the perfect spot. We came out playing really well and got a few breaks but we’re just really pleased with how we positioned the rocks this game,” Gallant said. The team feels determined to make another strong push towards winning their second Canadian mixed doubles title. Last year they competed in the Canad Inns Canadian Mixed Doubles Curling Trials and lost in the semifinal, a moment that still stings. 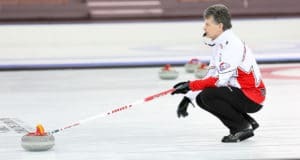 And while a berth to the Olympics is not on the line, they feel motived to represent Canada at the 2019 World Mixed Doubles Championship in Stavanger, Norway form April 20-27. But first they’ll need to defeat defending champion Walker/Muyres in the semifinal on Sunday morning. Walker/Muyres bested Bobbi Sauder/Brendan Bottcher 9-3 in six ends. 2018 mixed doubles finalists Sahaidak and Lott started the day slow but progressed throughout the day. It ended with a 7-4 victory against Dezaray Hawes/Tyler Tardi in the quarter-finals. The game was tight and tied 3-3 at the fourth-end break, but they scored one in the fifth and stole three in the sixth, which led the way to a 7-4 win. “It was a rocky start this morning, but we picked it right up and kept grinding through it,” Sahaidak said. 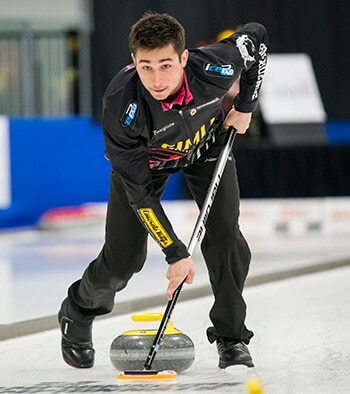 The team from Winnipeg Beach, Man., needed to win a qualification game against fellow Manitobans Melissa Gordon and Kyle Kurz. Gordon/Kurz took an early 3-0 lead before Sahaidak/Lott found their footing and came back to win 7-4. It was a game where Lott felt he was just a little off on reading the ice and couldn’t quite get the angles right. The duo burst onto the mixed doubles scene last year. 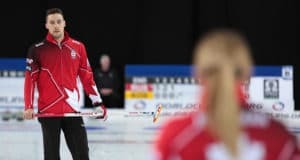 In addition to making the national final – an event they hoped to just win a couple games at – they also represented Canada at the third leg of the Curling World Cup in Jonkoping, Sweden and won the entire event. That win earned them the opportunity to compete in the Grand Final this May and representing Canada at world’s would be ideal practice. They believe they can win it all here too. But first they’ll need to win their semifinal game against a Martin/Griffith duo that has played strongly at this event. They scored three in the final end against Shannon Birchard/Tyrel Griffith for a 7-6 victory. The semifinals commence at 10 a.m. (all times AST) on Sunday. The winners advance to the final at 3 p.m.
Go to http://www.cbc.ca/sports/olympics/winter/curling/broadcast for the full schedule. Previous: Everest Canadian Seniors kicks off in Chilliwack, B.C.